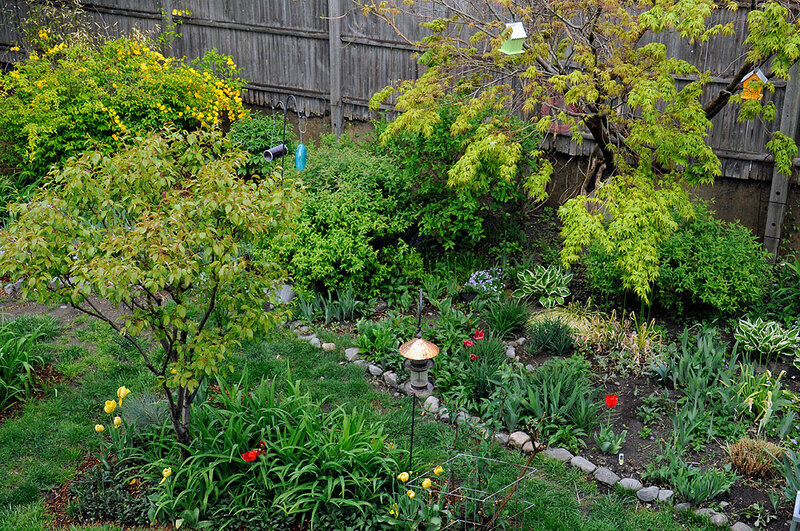 When we first hung the set of bird cottages out in the RainyDayGarden, a few readers had inquired whether we were concern regarding their ability to withstand the elements. The reason for the questions was because there were some comments posted on Gardener’s Supply Company’s site regarding the item’s quality. We read them and had considered sealing the cottages with polyurethane before putting them outside. Instead, we left them as is and decided to see how they would fare. After having left them out in all kinds of weather, we thought it was time to share our observations (in reverse chronological order). We have had three snow storms in December and we just got another foot of the white stuff last week. 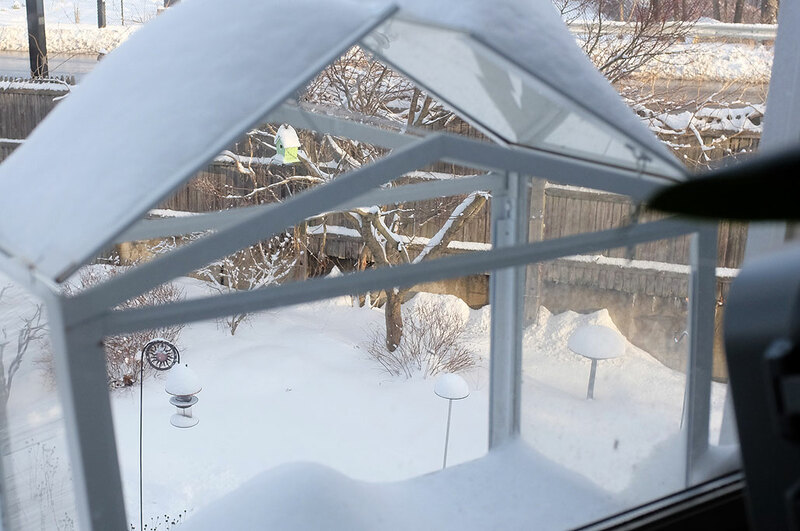 The first one was a dusting, but the second and third storms dropped over 12″ of the white stuff. They were good opportunities for some photos of the bird cottages as they really look great with snow on them. 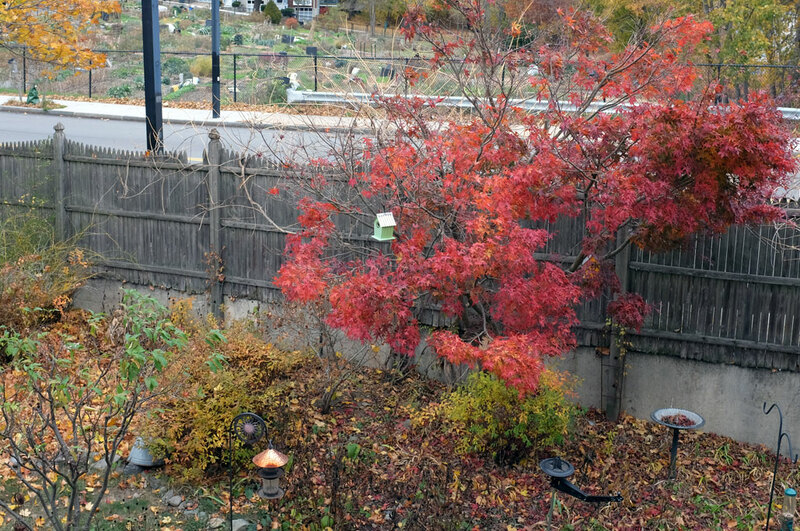 The bird cottages, after almost a year of being outside, have held up extremely well. 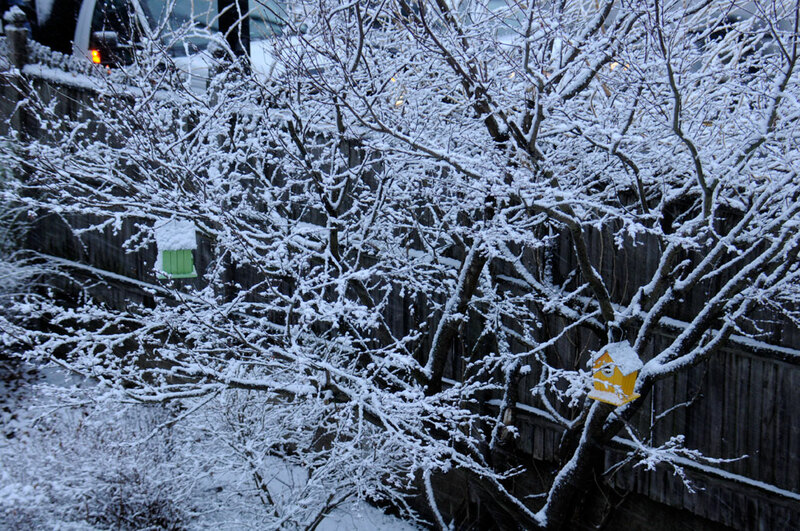 Of course, this is the first snow season for these bird cottages so we don’t know how they will be after three months of exposure. However, with the number of storms we have had already, we may have to touch up the paint some in the Spring. Regardless, we are confident that they will make it through the Winter structurally intact. With the colors of the leaves changing, the orange and green cottages stood out nicely against the bright reds of the Japanese Maple. The Summer heat was no problem for the cottages. Having them in the shade of the leaves gave them some protection from the direct sun. We think they would have had a tougher time of it had they been completely exposed. 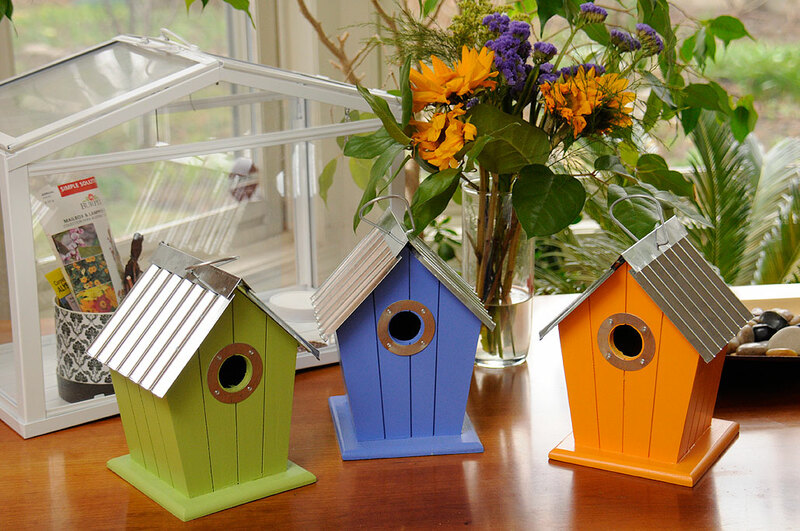 We could not think of happier additions for the RainyDayGarden than these bird cottages. They are bright, cheery, and whimsical. An excellent complement to the happy colors and energy of Spring. We acquired the set of bird cottages in April. The intent was to have it installed so any interested birds will be able to nest in it for the season. By the time we had them up, it was a too late for 2013, but now that they are up we hope 2014 will prove different. Looking at the latest photos of the cottages, it is clear that the colors have faded compared to the originals. We have also noticed some chipping and cracking of the paint. However, after almost a year, that was to be expected. We have not decided what to do yet, but we will not do anything until the end of Winter. Whatever we decide to do, we will definitely get it done before the start of nesting season. 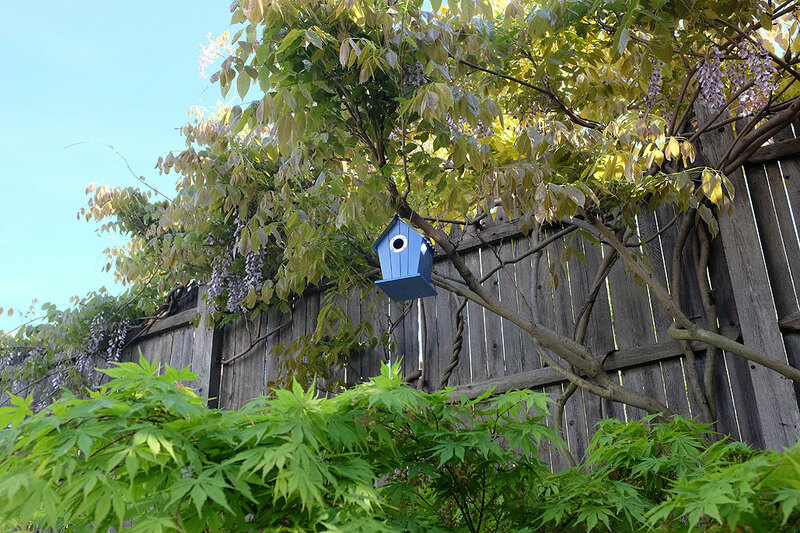 We have had good luck with our set of bird cottages and have no reservations in recommending them to our RainyDayGarden readers. However, should you experience any problem with yours, we are certain that Gardener’s Supply Company will make it right. They stand by their products and have a great guarantee. So shop with confidence and look forward to Spring!